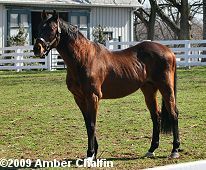 Alysheba at the Kentucky Horse Park in March 2009 shortly before his death. On Friday night, racing lost another one of its living legends, as 1987 Kentucky Derby winner and 1988 Horse of the Year Alysheba was humanely euthanized. He fell in his stall at the Kentucky Horse Park that afternoon, and after being transported to the Hagyard Equine Medical Institute directly across the road from the park. Dr. Nathan Slovis and his team treated Alysheba and determined that he had sustained an insurmountable injury. Dr. Slovis, along with veterinary staff of both owner King Abdullah of Saudi Arabia and the Kentucky Horse Park made the decision to have him put down at 11:13 PM. On Saturday morning, he was buried at the Hall of Champions across from the grave of John Henry. A memorial service will be planned at a later date. Until his death, Alysheba was the oldest living Kentucky Derby winner. The son of Alydar out of Bel Sheba was sold as a yearling to Dorothy and Pam Scharbauer for $500,000. 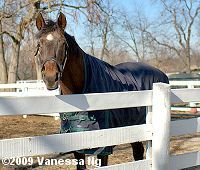 Sent to the barn of Hall of Fame trainer Jack Van Berg, he won the 1987 Kentucky Derby (G1), Preakness Stakes (G1), Super Derby (G1), and an Eclipse Award as Champion 3-year-old colt. He was narrowly beaten in that year's Breeders' Cup Classic by eventual Horse of the Year Ferdinand. As a 4-year-old, he was even better, winning six Grade 1 stakes: the Strub Stakes, Santa Anita Handicap, Iselin Handicap, Woodward Stakes, Meadowlands Cup and the Breeders' Cup Classic, earning him Horse of the Year honors. He retired with 11 wins in 26 starts and earnings of $6,670,242, as the world's richest Thoroughbred. He stood at Lane's End Farm where he sired 11 stakes winners, before being sold to the Saudi Arabian royal family. He was inducted into the National Museum of Racing and Hall of Fame in 1993. In October 2008, King Abdullah returned him home as a gift to the American people after 8 years in the royal stables. Kathy Hopkins, the park's Director of Equine Operations explained, "Due to a chronic degenerative spinal condition that led to ataxia and instability, Alysheba fell in his stall yesterday injuring his right hind femur. Complicated by his advanced age, this trauma resulted in severe pain that did not respond to analgesic therapy. The resulting pain and suffering, and the inability to stand unaided, led to a joint decision for euthanasia." John Nicholson, executive director of the Park said, "Alysheba had just become part of the Kentucky Horse Park family last fall and we were looking forward to having him for many years to come." Frank McGovern, General Manager of King Abdullah's stables thanked the park staff for trying to save Alysheba. He stated "his injury is one of those incidents that is not uncommon in older horses, and, unfortunately, nothing can ever be done. I am glad that he was back home and enjoying the first shoots of Spring before this happened." He added his thanks to the Kentucky Horse Park team "for their work in making Alysheba a star again." Upon learning of Alysheba's death, his regular jockey Chris McCarron said, "Obviously what happened was incredibly tragic, and I'm saddened by it. We had a great run with him. I was very pleased he was able to come home to his birthplace and spend the last couple of months of his life here. It was so much fun coming back to the winner's circle at Churchill Downs after the (1988) Breeders' Cup. There was a group of people behind the winner's circle with a big sign saying, 'Alysheba for President.' That's the kind of following he had." His trainer Jack Van Berg said, "He was just a great, great horse. We never got to see the best of him. He'd do things you couldn't believe." John Asher of Churchill Downs called Alysheba's near-fall in the 1987 Preakness as " "the greatest pure athletic feat I've ever seen. If he goes down, half the field goes over him. (Veteran trainer) Willard Proctor told Jack (Van Berg), 'They fall down, they get back up sometimes. They don't get back up and win.' But he popped up and didn't miss stride. You can't have an argument about the best horses in the last 25 years of the 20th century and not include him. I always describe him as Michael Jordan in horseshoes." 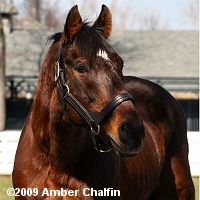 Alysheba at the Kentucky Horse Park in March 2009. Alysheba will be buried across from John Henry, near his paddock at the Hall of Champions. The Kentucky Horse Park will hold a public memorial service at a later date. Alysheba - his bio with a complete race record from Home of Alydar. Includes links to video from several of his races. Alysheba in the Hall of Fame - includes a bio, some photos, and videos. 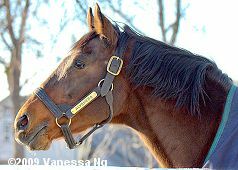 Alysheba at Lane's End Farm - a photo from the 1990's when he was standing at stud there. 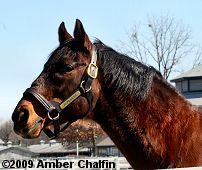 Alysheba at the Kentucky Horse Park in early January 2009 from Vanessa Ng. If any of his fans have a favorite photo of him that they would like to have added to this, please email it to me and I will be glad to include it. It must be your own photo though so there are no copyright violations. Thanks! Thanks to Amber Chalfin for the photographs from March 21.